Post Time Sign Services, Inc. SERVING THE PROFESSIONAL REALTORS AND BROKERS OF MARYLAND, DC AND NORTHERN VIRGINIA. Specializing in fast paced image enhancing real estate sign installation & removal services. We are a full service Real Estate sign installation and removal service company serving most counties in the Maryland, Washington DC, and Northern Virginia areas. For over a decade we have been delivering elite services to some of the top producing Brokers and Real estate Agents in the Washington DC metro area. We take great pride in the level of service that we are able to provide to our very long list of demanding clients. We are set up as a preferred vendor with most Washington area real estate brokerages. Our service area covers a large portion of the Washington, DC Metro area with about 97% of all jobs received before 5:00pm, being completed before the close of business the following day. Our services are unique to the manor in which we've set up our service areas. 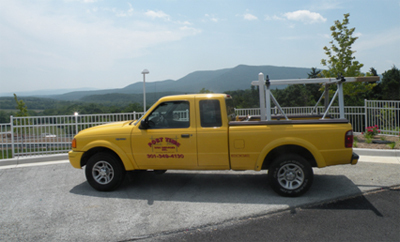 All of our contractor/installers are assigned to service the areas within which they live so they can closely attend to our clients needs in their area and to assure that their needs are always met. All of our contractors are well trained in sign placement to assure that your signs are placed in the most visible location to ensure maximum exposure. At Post Time Signs, all of our posts are constructed of #2 4x4 pressure treated timbers with crown cuts on all points. In addition, all of our signposts are cleaned and are freshly painted after each installation. To further enhance our service Post Time Signs will also store all agents' signs, riders, and brochure boxes free of charge. If you should choose to have us store your signs and accessories, we would ask that you provide us with enough sings to distribute throughout our team of installers so that they will have on hand what they would need to do the job on the first trip. If you should choose to maintain your own sign panels, we can attach them for you if they are left at the property at the time that the post is installed. Click on services and products to view different types of post and different circumstances in which we can accommodate any unique situation for sign placement. Need a real estate sign panel made? Click the link shown below to order any style broker sign needed from our affiliate sign manufacturer, (Sign Source), one of the top producing sign manufactures within the industry, which in addition is a corporate approved vendor for almost all brokers. In addition to real estate panel signs, we also specialize in the manufacture of any size (Building lot signs), (Construction signs), (Acreage signs with graphic lot images), or any other sign of any type that you may need and/or desire. Refunds and credits are only given if the job is canceled prior to our installer arriving to the property in which the sign service was ordered.